beluga or white whale, Delphinapterus leucas courtship | Flickr - Photo Sharing! The beluga or white whale, Delphinapterus leucas, is an Arctic and sub-Arctic cetacean. It is one of two members of the family Monodontidae, along with the narwhal. This marine mammal is commonly referred to simply as the beluga or sea canary due to its high-pitched twitter. It is up to 5 m (16 ft) in length and an unmistakable all-white color with a distinctive protuberance on the head. From a conservation perspective, the beluga is considered "near threatened" by the International Union for Conservation of Nature; however the subpopulation from the Cook Inlet in Alaska is considered critically endangered and is under the protection of the United States' Endangered Species Act. Of seven Canadian beluga populations, two are listed as endangered, inhabiting eastern Hudson Bay, and Ungava Bay. In 1776, Peter Simon Pallas first described the beluga. It is a member of the Monodontidae family, which is in turn part of the toothed whale suborder. The Irrawaddy dolphin was once placed in the same family; however, recent genetic evidence suggests otherwise. The narwhal is the only other species within the Monodontidae besides the beluga. The Red List of Threatened Species gives both beluga and white whale as common names, though the former is now more popular. The English name comes from the Russian белуха (belukha), which derives from the word белый (belyy), meaning "white". It is sometimes referred to by scientists as the belukha whale to avoid confusion with the beluga sturgeon. The whale is also colloquially known as the sea canary on account of its high-pitched squeaks, squeals, clucks and whistles. A Japanese researcher says he taught a beluga to "talk" by using these sounds to identify three different objects, offering hope that humans may one day be able to communicate effectively with sea mammals. Male belugas are larger than females. Length can range from 2.6 to 6.7 m (8.5 to 22 ft), averaging 4 m (13 ft) in males and 3.6 m (12 ft) in females. Males weigh between 1,100 and 1,600 kg (2,400 and 3,500 lb), occasionally up to 1,900 kg (4,200 lb) while females weigh between 700 and 1,200 kg (1,500 and 2,600 lb). They rank as mid-sized species among toothed whales. The adult beluga is rarely mistaken for another species, because it is completely white or whitish-gray in color. Calves, however, are usually gray. Its head is unlike that of any other cetacean. Like most toothed whales it has a melon—an oily, fatty tissue lump found at the center of the forehead. The beluga's melon is extremely bulbous and even malleable. The beluga is able to change the shape of its head by blowing air around its sinuses. Unlike many dolphins and whales, the vertebrae in the neck are not fused together, allowing the animal to turn its head laterally. The rostrum has about 8 to 10 teeth on each side of the jaw and a total of 34 to 40 teeth. Belugas have a dorsal ridge, rather than a dorsal fin. The absence of the dorsal fin is reflected in the genus name of the species—apterus the Greek word for "wingless." The evolutionary preference for a dorsal ridge rather than a fin is believed to be an adaptation to under-ice conditions, or possibly as a way of preserving heat. As in other cetaceans, the thyroid gland is relatively large compared to terrestrial mammals (proportionally three times as large as a horse's thyroid) and may help to sustain higher metabolism during the summer estuarine occupations. The beluga inhabits a discontinuous circumpolar distribution in Arctic and sub-Arctic waters ranging from 50° N to 80° N, particularly along the coasts of Alaska, Canada, Greenland, and Russia. The southernmost extent of their range includes isolated populations in the St. Lawrence River estuary and the Saguenay fjord, around the village of Tadoussac, Quebec, in the Atlantic and the Amur River delta, the Shantar Islands and the waters surrounding Sakhalin Island in the Sea of Okhotsk. In the spring, the beluga moves to its summer grounds: bays, estuaries and other shallow inlets. These summer sites are discontinuous. A mother usually returns to the same site year after year. As its summer homes clog with ice during autumn, the beluga moves away for winter. Most travel in the direction of the advancing icepack and stay close its edge for the winter months. Others stay under the icepack—surviving by finding ice leads and polynyas (patches of open water in the ice) in which they can surface to breathe. Beluga may also find air pockets trapped under the ice. The beluga's ability to find the thin slivers of open water within a dense ice pack that may cover more than 96% of the surface mystifies scientists. Its echo-location capabilities are highly adapted to the sub-ice sea's peculiar acoustics and it has been suggested that belugas can sense open water through echo-location. In 1849, while constructing the first railroad between Rutland and Burlington in Vermont, workers unearthed the bones of a mysterious animal in the town of Charlotte. Buried nearly 10 feet (3.0 m) below the surface in a thick blue clay, these bones were unlike those of any animal previously discovered in Vermont. Experts identified the bones as those of a beluga. Because Charlotte is over 150 miles (240 km) from the nearest ocean, early naturalists were at a loss to explain the bones of a marine mammal buried beneath the fields of rural Vermont. Today, the Charlotte whale aids in the study of the geology and the history of the Champlain Basin, and this fossil is now the official Vermont State Fossil (making Vermont the only state whose official fossil is that of a still extant animal). On June 9, 2006, a young beluga carcass was found in the Tanana River near Fairbanks in central Alaska, nearly 1,700 kilometers (1,100 mi) from the nearest ocean habitat. Belugas sometimes follow migrating fish, leading Alaska state biologist Tom Seaton to speculate that it had followed migrating salmon up the river at some point in the prior fall. Belugas are highly sociable. Groups of males may number in the hundreds, while mothers with calves generally mix in slightly smaller groups. When pods aggregate in estuaries, they may number in the thousands. This can represent a significant proportion of the entire population and is when they are most vulnerable to hunting. Pods tend to be unstable, meaning that they tend to move from pod to pod. Radio tracking has shown that belugas can start out in a pod and within a few days be hundreds of miles away from that pod. Mothers and calves form the beluga's closest social relationship. Nursing times of two years have been observed and lactational anestrus may not occur. Calves often return to the same estuary as their mother in the summer, meeting her sometimes even after becoming fully mature. Belugas can be playful—they may spit at humans or other whales. It is not unusual for an aquarium handler to be drenched by one of his charges. Some researchers believe that spitting originated with blowing sand away from crustaceans at the sea bottom. Unlike most whales, it is capable of swimming backwards. Males reach sexual maturity between four and seven years, while females mature at between six and nine years. The beluga can live more than 50 years. Female belugas typically give birth to one calf every three years. Most mating occurs between February and May, but some mating occurs at other times of year. It is questionable whether the beluga has delayed implantation. Gestation lasts 12 to 14.5 months. Calves are born over a protracted period that varies by location. In the Canadian Arctic, calves are born between March and September, while in Hudson Bay, the peak calving period is in late June, and in Cumberland Sound, most calves are born from late July to early August. Newborns are about 1.5 metres (4.9 ft) long, weigh about 80 kilograms (180 lb), and are grey in color. The calves remain dependent on their mothers for at least two years. The beluga is a slow swimmer that feeds mainly on fish. It also eats cephalopods (squid and octopus) and crustaceans (crab and shrimp). Foraging on the seabed typically takes place at depths of up to 1,000 feet (300 m) but they can dive at least twice this depth. 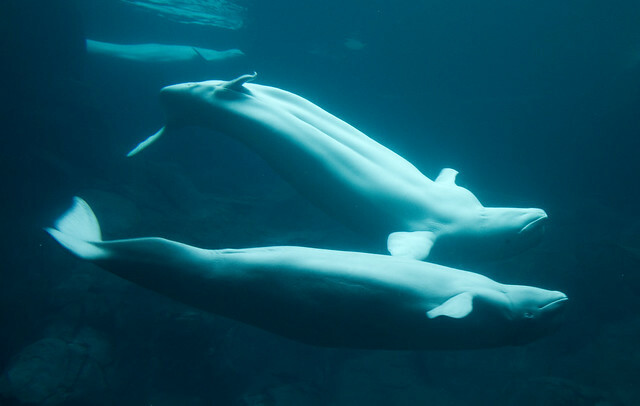 A typical feeding dive lasts 3–5 minutes, but belugas submerge for up to 20 minutes at a time. Polar bears take particular advantage of situations when belugas become trapped by ice and are thus unable to reach the ocean. The bears swipe at the belugas and drag them onto the ice. The orca is its other significant natural predator. Belugas were among the first whale species in captivity. The first beluga was shown at Barnum's Museum in New York City in 1861. Today it remains one of the few whale species kept at aquaria and sea life parks across North America, Europe, and Asia. Its popularity there with visitors reflects its attractive color, and its range of facial expressions. While most cetacean "smiles" are fixed, the extra movement afforded by the beluga's unfused cervical vertebrae allows a greater range of apparent expression. Most belugas found in aquaria are caught in the wild, though captive breeding programs enjoy some success. Both the United States Navy and the Russian Navy have used belugas in antimining operations in Arctic waters. In one instance, a captive beluga brought a cramp-paralyzed diver from the bottom of the pool up to the surface by holding her foot in its mouth, certainly saving the female diver's life. The global population of belugas today stands at about 100,000. Although this number is much greater than that of many other cetaceans, it is much smaller than pre-hunting populations. There are estimated to be 40,000 individuals in the Beaufort Sea, 25,045 in Hudson Bay, 18,500 in the Bering Sea, and 28,008 in the Canadian Low Arctic. The population in the St. Lawrence estuary is estimated to be around 1,000. It is considered an excellent sentinel species (indicator of environment health and changes). This is because it is long-lived, on top of the food web, bearing large amounts of fat and blubber, relatively well-studied for a cetacean, and still somewhat common. Because of its predictable migration pattern and high concentrations, the beluga has been hunted by indigenous Arctic peoples for centuries. In many areas, hunting continues, and is believed to be sustainable. However, in other areas, such as the Cook Inlet, Ungava Bay, and off western Greenland, previous commercial operations left the populations in great peril. Indigenous whaling continues in these areas, and some populations continue to decline. These areas are the subject of intensive dialogue between Inuit communities and national governments aiming to create a sustainable hunt. Papillomaviruses have been found in the gastric compartments of belugas in the St. Lawerence River. Herpesvirus as well has been detected on occasion in belugas. Encephalitis has sometimes been observed and the protozoa Sarcocystis can infect the animals. Ciliates have been observed to colonize the blowhole yet may not be pathogenic or especially harmful. Erysipelothrix rhusiopathiae bacilli, likely from contaminated fish in the diet, can endanger captive belugas, causing anorexia, dermal plaques, and lesions. This may lead to death if not diagnosed early and treated with antibiotics. As of 2008, the beluga is listed as "near threatened" by the IUCN, due to uncertainty about the number of belugas over parts of its range (especially the Russian Arctic), and the expectation that if current conservation efforts cease, especially hunting management, the beluga population is likely to qualify for "threatened" status within five years. Prior to 2008, the beluga was listed as "vulnerable", a higher level of concern. IUCN cited the stability of the largest subpopulations and improved census methods that indicate a larger population than previously estimated. To prevent hunting, belugas are protected under the International Moratorium on Commercial Whaling; however, small amounts of beluga whaling are still allowed. Since it is very difficult to know the exact population of belugas because their habitats include inland waters away from the ocean, it is easy for them to come in contact with oil and gas development centers. To prevent whales from coming in contact with industrial waste, the Alaskan and Canadian governments are relocating sites where whales and waste come in contact. Subpopulations are subject to differing levels of threat and warrant individual assessment. The Cook Inlet subpopulation is listed as "Critically Endangered" by the IUCN as of 2006. The Cook Inlet beluga population is listed as Endangered under the Endangered Species Act as of October 2008. This was due to overharvesting of belugas prior to 1998. The population has failed to recover even though the reported harvest has been small. The most recent published estimate as of May 2008 was 302 (CV=0.16) in 2006. In addition, the National Marine Fisheries Service indicated the 2007 aerial survey's point estimate was 375. The Beluga whale is listed on appendix II of the Convention on the Conservation of Migratory Species of Wild Animals (CMS). It is listed on Appendix II as it has an unfavourable conservation status or would benefit significantly from international co-operation organised by tailored agreements. cheryladay, roxyaedoo, depitcher, and 28 other people added this photo to their favorites. Hello! We at One World One Ocean used this photo in our educational ocean newscast, the Weekly Dive, which you can see here: www.oneworldoneocean.org/video/entry/weekly-dive-whale-yo.... Thanks for making it available!